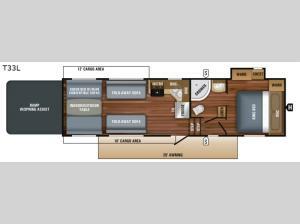 RV News "Best of Show"
In this Octane toy hauler you have everything you need for a successful adventure in the great outdoors. With the forty gallon fuel station, you will never have to worry about keeping your outdoor vehicles fueled and ready for fun, and you also will not have to worry about keeping your privacy when sleeping on the king-sized, Jayco-exclusive Simmons mattress in the master suite. The electric queen-size bunk and convertible sofas in the cargo area, along with the two fold-away sofas give this trailer the ability to sleep eight people comfortably.